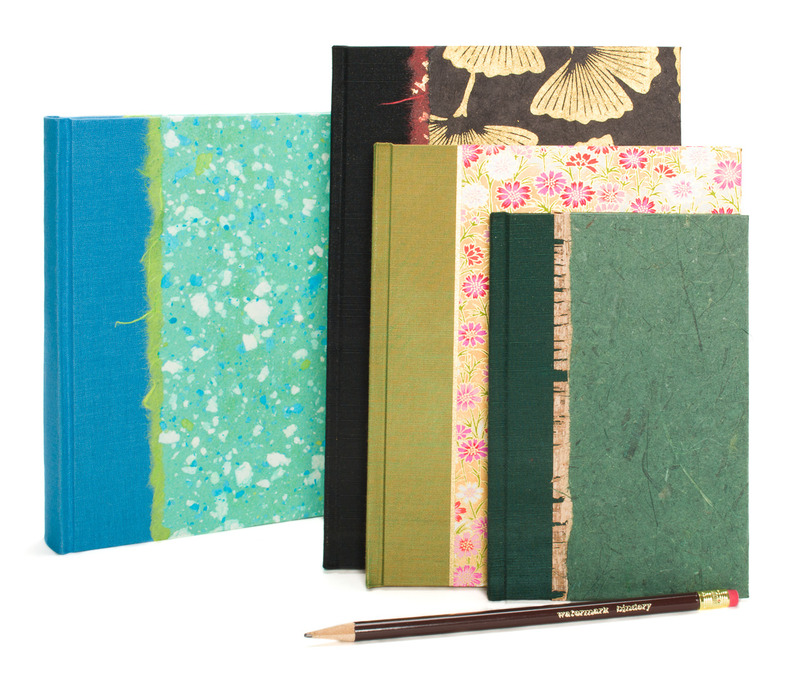 Our Journals and Notebooks come in four sizes. We have been making fine, hand-bound books since 1973. Like all of our books, we make them by hand in our studio. We bind the books in a traditional binding style and we sew our book blocks by hand, with needle and Irish linen thread and the book will stay flat when open. We offer many different cover styles using beautiful printed and textured papers from around the world, and we can customize a cover style to your liking. Just ask us. The inside pages use an 80# (118 gsm) writing paper in natural white with deckled edges, that has the look and feel of hand-made paper. The paper has a textured surface and works well with pens, pencils and felt pens. Some of our customers even use it for watercolors. All books have 92 pages (46 leaves,) or optionally 188 pages (94 leaves.) The 92 page book is 1/2” thick and the 188 page book is 7/8” thick.